All the gas giants in our Solar System have rings. None of the terrestrial planets do. 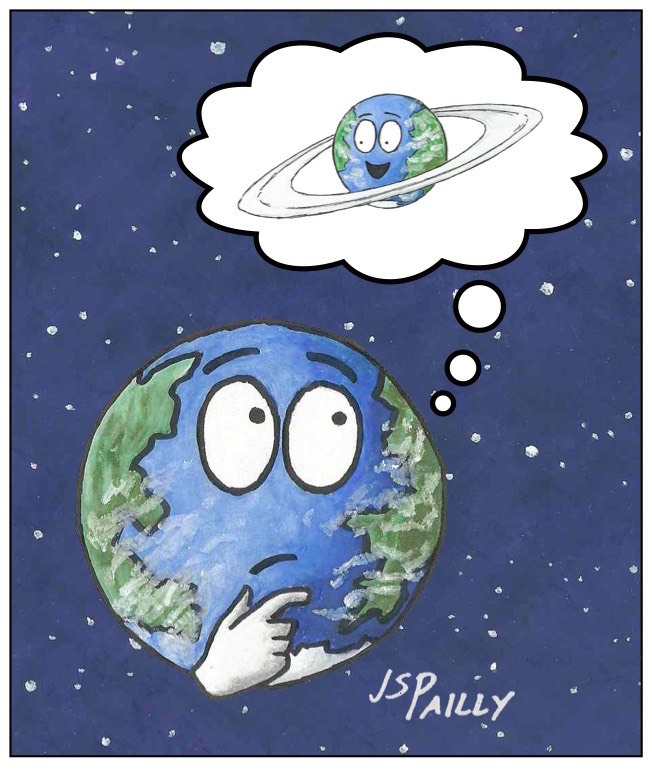 Based on that, you could be forgiven for assuming that only gas giants can have rings, but astronomers have discovered at least one asteroid has rings, and there’s no real reason why a planet like Earth couldn’t have rings too. If Earth wants rings of its own, it should seek advise from Saturn. Saturn has the most beautiful rings of them all, but how did Saturn get its rings? That is a matter for ongoing scientific debate. A Former Moon: One of Saturn’s moons wandered too close to the planet. Once its orbit crossed the Roche limit, this poor unfortunate moon was torn apart by Saturn’s gravity. A Failed Moon: Alternatively, the rings may consist of material left over from the formation of Saturn and its moons. Because this material was within the Roche limit, it never coalesced into a moon in the first place. 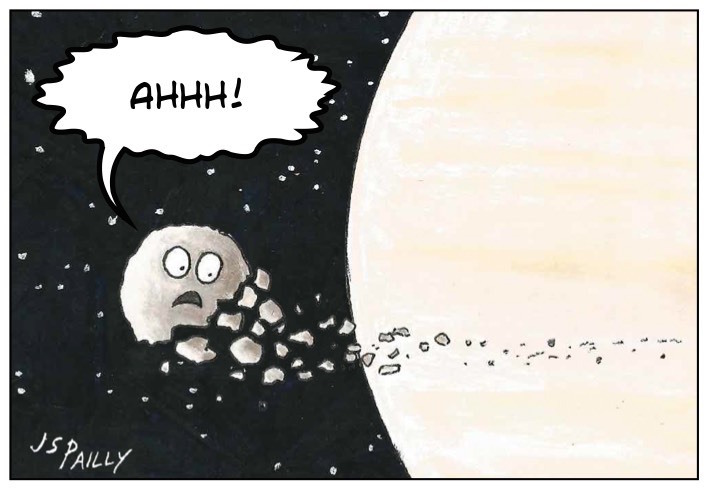 Meteorite Debris: Debris from meteorite impacts on Saturn’s various moons may have gradually accumulated inside the Roche limit, preventing it from re-coalescing as a new, rubble pile moon. Outgassing: Volatiles like water vapor are constantly spewing from certain Saturnian moons. Perhaps these outgassed materials gradually accumulated around Saturn, either alone or in combination with meteorite debris. Personally, I prefer the idea that Saturn destroyed one of its own moons to make its rings. Firstly, that would be awesome. Secondly, the exceptional size and brightness of Saturn’s rings seems to suggest, at least in my mind, that they formed suddenly and relatively recently. However, compelling cases can be made for all of these ideas, especially outgassing. At least some of Saturn’s many rings clearly originate from nearby outgassing moons (but I can’t imagine outgassing accounting for all the rings). So if Earth really wants rings of its own, the best bet is probably to get a moon inside the Roche limit and let gravity tear it apart. Maybe this is why the Moon is slowly and cautiously moving away from the Earth. Today’s post is part of Saturn month for the 2015 Mission to the Solar System. Click here for more about this series. Posted by J.S. Pailly on September 7, 2015 in Mission to the Solar System, Saturn (2015 Mission). Well, perhaps it would be best for Earth to NOT attract our moon. I enjoy going to the ocean and watching the waves. And how would werewolfs know to change without the moon’s influence. Excuse me while I go stare at the ringless night.